FLAGSTAFF – James and Kay Burr had visited 20 national parks over the course of their seven-week vacation, ranging from Olympic National Park in coastal Washington to Badlands National Park in South Dakota. 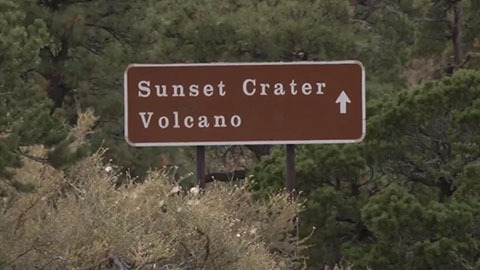 When the Los Angeles couple spotted a sign for Sunset Crater National Park on the way home from the Grand Canyon, they decided on a whim to visit a 21st. “We saw it on the side of the road, and figured we might as well visit,” Kay Burr said. 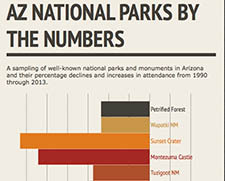 While the Burrs made a point of visiting more of these wonders, visitor counts show that fewer people overall have been visiting Arizona’s national parks than they did in previous years. Of the 20 national parks, monuments, recreation areas and trading posts in Arizona with visitation data on the National Park Service website, 15 saw fewer visitors in 2013 than they did in 1990, according to a review of the data. All told, attendance at Arizona national parks has declined by more than 18 percent – from 20.37 million to 16.66 million – over the past 24 years. 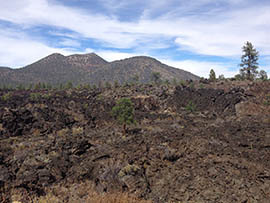 Sunset Crater’s decline has exceeded 60 percent during that period. Located 36 miles northeast of Flagstaff, the orange-red cinder dome at Sunset Crater National Park stands out among the forested mountains. The dormant volcano last erupted around 1,000 years ago, and the surrounding landscape is still covered in black lava rock. The unique landscape has historically attracted visitors from all over the world. But after seeing almost 600,000 visitors in 1992, Sunset Crater saw 184,000 in 2013. While Richards attributed the decline in the mid-1990s – when the park saw its yearly attendance drop by more than 50 percent from 1995 to 1996 – to a change in the way the park counted visitors, the general decline matches patterns found at other national parks in northern Arizona. Wupatki National Monument, located just up the road from Sunset Crater, saw its yearly attendance dip below 200,000 in 2013 after a high of more than 260,000 in the mid-1990s. The historically successful Petrified Forest National Monument saw more than 1.1 million people in 1970 but fewer than 650,000 in 2013. “Petrified Forest has not been as welcoming as it could be,” Brad Traver, superintendent of Petrified Forest National Park, said in telephone interview. Nationally, the figures tell a more positive story. Jeffrey Olson, a spokesman for the National Park Service, said that overall yearly attendance at national parks has increased by more than 100 million since 1970. But while an iconic park like the Grand Canyon has flourished, with more than 4.5 million visitors in 2013, up from 3.78 million in 1990, it’s been a different story for the smaller parks in northern Arizona. In other examples, Montezuma Castle National Monument, which peaked at more than a million visitors in 1996, reported 389,000 for 2013, while nearby Tuzigoot National Monument drew 86,000 in 2013 versus a high of 131,000 in 1997. While there’s no obvious reason why some national parks and monuments have seen their numbers decline, Cheryl Cothran, director of the Arizona Hospitality Research and Resource Center at Northern Arizona University, links the attendance drop to a number of factors, including changing interests with the new generation. Cothran also pointed to fluctuations in the economy. She said that many Arizona parks are dependent on people driving to the Grand Canyon and visiting other parks in the area on the same trip. Rising gas prices have made long road trips more difficult for the middle-class families that national parks have historically relied upon. “I think the parks are largely dependent on circumstance,” Cothran said. Moreover, national parks are limited in how they can promote themselves. Petrified Forest’s Traver said that national parks lack the budget or authority to advertise themselves the way that private parks can. Additionally, Sunset Crater’s Richards said that parks are limited in how frequently they can issue visitor surveys by the Federal Paperwork Reduction Act of 1980. The most recent visitor survey issued by the National Park Service occurred in 1996. Instead, parks have had to get creative. 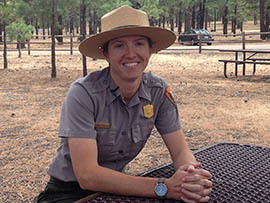 Citing a need to bring in more young people and non-native English speakers, Richards said that some of the northern Arizona parks have received grant money for the Moving in the Monuments program, which is designed to lure those for whom English is a second language from Flagstaff and other nearby communities. “The park service in general needs to do a better job of reaching out to new communities, and that’s one of our major goals moving forward,” Richards said. NAU’s Cothran said there’s still more that parks can do to promote themselves, suggesting that parks could bring in travel writers from other countries to encourage more international attention and partner with “gateway communities” to provide better lodging nearby. “Tusayan by the Grand Canyon is really a model for this sort of work,” Cothran said. But even with the new strategies, lesser-known parks are forced to rely on word of mouth as well as the curiosity that drives visitors like the Burrs. Attendance numbers in many U.S. national parks have been dropping since the '70s. Nearing its 100-year anniversary, the National Park Service is on a mission to attract more visitors. Cronkite News reporter Lacey Darrow spoke with tourists and rangers to find out more. 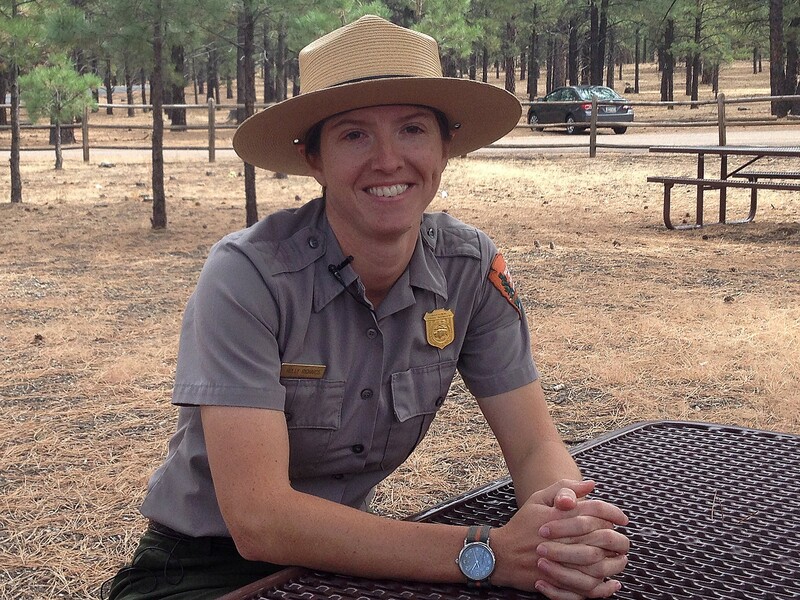 Holly Richards, supervisory park ranger for Sunset Crater National Park, talks about ways the park can encourage more visitors. The cinder dome of the Sunset Crater volcano dominates the landscape at Sunset Crater National Park.